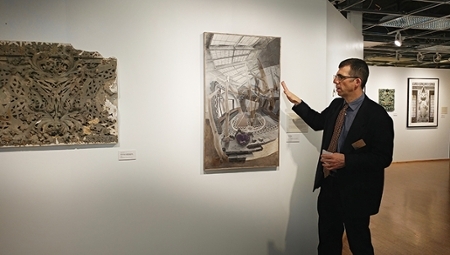 A series of events focusing on world-renowned architect Louis H. Sullivan (1856-1924), and hosted by Southern Illinois University Edwardsville and community partners, have engaged and inspired crowds of attendees from across the state. One of the featured events will continue through Friday, March 17 at the Edwardsville Arts Center. The exhibit, “Louis’s Legacy: Artists Respond to Louis Sullivan,” features the work of an SIUE graduate student, faculty members and alumni. It is curated by Brigham Dimick, MFA, professor in the SIUE Department of Art & Design. “The exhibit juxtaposes Sullivan architectural ornaments from the SIUE University Museum’s Louis H. Sullivan Architectural Ornament Collection with regional artists who use the form of Sullivan’s work and biography of his life as a platform for their own creative projects,” said Erin Vigneau-Dimick, collections manager of The University Museum, the exhibit’s sponsor. The Louis H. Sullivan Architectural Ornament Collection at SIUE is the largest known collection of physical ornaments from Sullivan constructions. The full-day “Louis Sullivan Architectural Ornaments at SIUE Conference: Bringing the Past to Life in the 21st Century” featured the unique academic resource and showcased its significance. Seventy individuals attended the event held Feb. 24, with sessions at SIUE’s Morris University Center, Lovejoy Library and the Edwardsville Arts Center. Keynote speakers included Mark Richard Smith, a Sullivan documentary film producer, John Celuch, Inlandesign director and first curator of the SIUE Sullivan Collection, and Ward Miller, executive director of Preservation Chicago. Additionally, Arts & Issues’ presentation of “Louis Sullivan: The Struggle for American Architecture” was viewed by a full house in Dunham Hall Theater on Feb. 23. The feature-length documentary about the brilliant Chicago architect was introduced by film director Mark Richard Smith. “The sold-out crowd at the Louis Sullivan presentation shows a real demand for Louis Sullivan information, and highlights the importance of the Louis Sullivan collection here at SIUE,” said Grant Andree, director of SIUE’s Arts & Issues. “Bringing in the director, Mark Richard Smith, was an added bonus for Arts & Issues. SIUE is also home to the Louis H. Sullivan Architectural Ornaments digital collection, which has increased access to the images of the Sullivan architectural ornaments within or near Lovejoy Library. Artworks by SIUE students of professors John DenHouter and Rodrick Whetstone inspired by Louis Sullivan designs will be exhibited through the end of April in SIUE’s Lovejoy Library, near the Louis H. Sullivan Architectural Ornaments Exhibit on the Library’s second floor, southwest side. Video recordings from the conference will be available online when completed. For more information, visit siue.edu/lovejoylibrary/.